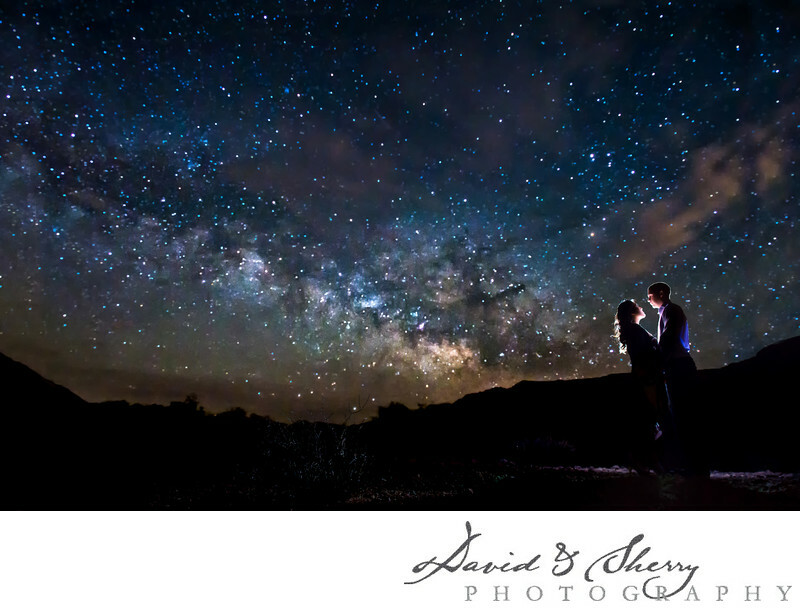 One of the more challenging things we have done in our photographic careers as wedding and engagement photographers is to learn how to capture the milky way at night and to incorporate our clients or bride and groom into the photos while keeping it look natural and honest to the scene. It took us many tries to get it right from finding the right locations to choosing the right time of month in the moon cycle to get the darkest skies and to choose the right lenses to get both the sharpness of the stars and the couple together with a shallow depth of field where it all looks beautiful together. In this photo we drove 2 hours north of Las Vegas to the Valley of Fire State Park and found a spot at 3:00am where we stayed with tripod in hand getting the shot just right, then placing our couple against the dark part of the background and froze them with the flash firing quickly then choosing a long exposure of 6-8 seconds in order to get enough light to see the stars in camera. We have now accomplished this on a number of occasions, even on a wedding day with bride and groom in their wedding attire. It is very rewarding, sometimes challenging and the results that come out create the world's most beautiful wedding photos.